How Do I Replace a Bathroom Fan? Clean brass bathroom fixtures with a vinegar paste. An alloy of the minerals copper and zinc, brass can tarnish easily if not cared for properly. Most brass bathroom fixtures have a coating that keeps them brilliant and tarnish free. However, over time the protective coating can begin to thin and provide less protection, especially if soap scum and hard water minerals sit on the surface of the brass for extended periods. Regular cleanings can keep your brass bathroom fixtures looking their best and free of tarnish stains. Dampen a sponge and add a squirt of dish soap to perform routine cleanings on brass bathroom fixtures. Rub the sponge over the fixtures, removing dirt and soap residues. Rinse the brass fixtures with clear water and buff dry with a soft cloth. Remove soap scum from brass bathroom fixtures with a homemade paste. Add a 1 part flour and 1 part salt to a ¼ cup of vinegar. Combine all of the ingredients in a small bowl and stir to create a paste. Rub the vinegar paste into the brass using a soft cloth. Do not dampen the cloth before applying the paste. Continue rubbing until the soap scum disappears and the brass fixtures buff to a brilliant shine. Clean your brass bathroom fixtures with half of a lemon when you are in a pinch. Simply cut a lemon in half and sprinkle a pinch of salt on top. Rub the lemon over the brass, followed by a light buffing with a soft cloth to make the brass shine. Squirt a dime-sized amount of ketchup onto a soft cloth. 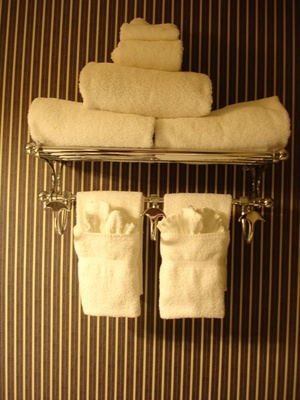 Rub the cloth over the brass bathroom fixtures to clean the brass and remove tarnish. Flip the soft cloth over to its clean side and buff the brass. Brass bathroom fixtures that have finishes permanently damaged by neglect can be restored using a professional metal polisher. A professional polisher can colorize, polish and buff the brass, making it look good as new.